Most assistants start out their careers when they are pretty young, probably in their teens and early 20’s. You really don’t think about how long you may be doing this type of work and what effect it could have on your body down the line. Back in the day, the most assistants would do was mixing, passing instruments, taking impressions, x-rays and cleaning up. Nowadays you add to that computers, digital designing and scanning and you start to see just how much our hands and bodies go through on a daily basis. These things involve a lot of repetitions which could eventually have an effect on your body. Carpal Tunnel – in the wrist and hands. Neck and shoulder pain resulting from tight muscles. A few minutes of upper body stretching in the morning and later in the day can help loosen those tight muscles in the neck, shoulders and back. Sitting on the assistant stool or chair with good posture is a habit you should always be aware of doing. Your stool should be higher than the doctors to have a better view and to avoid your body being in an awkward position. Your work shoes should be one of your best investments. I know there are many styles of gym shoes out there, all colorful and fancy, but don’t sacrifice comfort for cuteness. You’re on your feet all day and your shoes should be made with good shock absorbers and good arch support. Don’t just buy shoes for the cute appearance; buy a well-made pair. The fact is whether you’re assisting 2 or 20 years you may never experience any of these issues, only time can tell. It is not something that happens immediately, it develops over years and you begin to notice it gradually. Everyone’s body reacts differently to situati ons, but there is no harm in taking precautions. If you start to notice any changes in your hands or body that concern you talk to your medical doctor, they can advise you on the best solutions. Your feet, hands and body will thank you for it. Dental Stools (Crown Seating) – Ergonomically designed assistant stools that offers multiple styles suited to your needs to help alleviate back stress and better circulation in your legs. 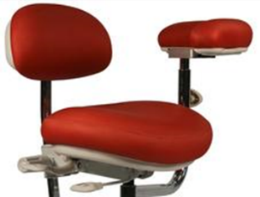 A nice feature they offer is the ability of the seat and the backrest to follow you as you lean forward and back on the stool when the control lever is placed in the “Free-Float” position.